The Flag of Great Britain has a more than 200 years history. It mirrors diversity and unity at the same time, and is even called “Union Jack”. If this symbol is sacred for you as a representative of one of the countries in this Kingdom, then you may want to have it even on accessories your dog wears – its muzzle, collar, or harness. 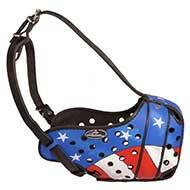 We are happy to help you to get at least a dog muzzle with Union Jack painted on it! 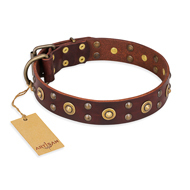 There is nothing more exclusive than handcrafted and hand-painted dog accessories. Just look how stylish it looks! The water-resistant painting will definitely not rub away, or decolorize. It will always gladden you and your friends with its bright three crosses: St. George's Cross, St. Andrew's Cross, and St. Patrick's Cross. Of course, we are proud of not only the style of our products. 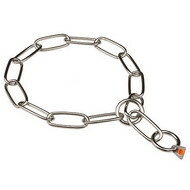 Their quality also turns heads and gets approval of our customers. 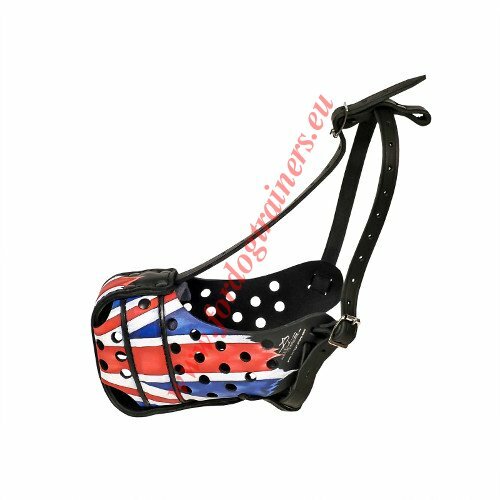 We've selected a well-oiled genuine leather without wastes to produce this “Union Jack” Leather Muzzle for Dogs of Medium and Large Breeds. A steel bar protecting the nose, is covered with leather, stitched and glued. 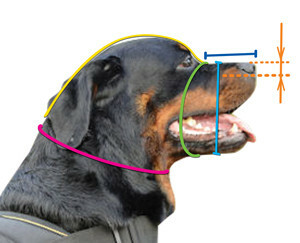 All the pats of this functional dog accessory are also stitched together, making reliable supreme quality product. 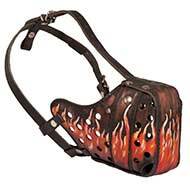 To eliminate pain or discomfort during agitation work, the muzzle is padded with thick soft felt at nose area. 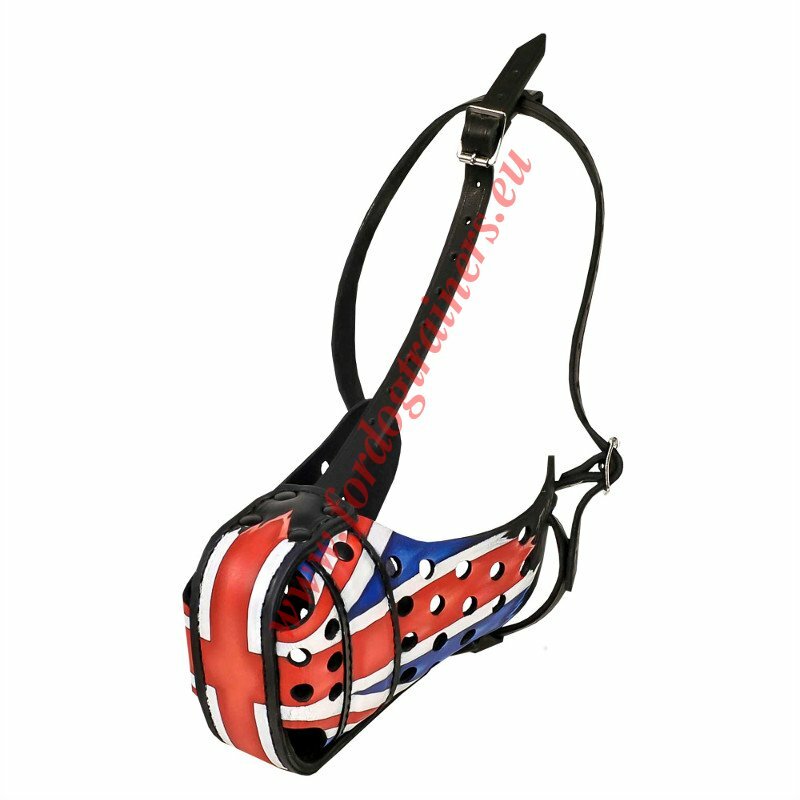 Soft Dog Muzzle Padded with Felt Painted "Union Jack"
You desire to provide as much air as possible for your dog to burst with energy and determination during attack or agitation training? No problem with our perfectly ventilated leather agitation muzzle – special holes situated on the sides of the muzzle make the fresh air flow available. Do not restrain your dog from running, training, playing and visiting public places with this painted Leather Dog Muzzle with “Union Jack”! 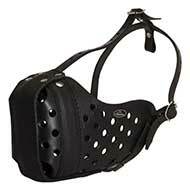 use leather balsam and conditioner to keep the muzzle looking as the new one. See other Luxurious Leather Dog Collars Leather Dog Leads, Excellent Training and Walking Harnesses and other outstanding products for your dog in our on-line pet store!